Corvette Racing narrowly missed out on its 100th IMSA WeatherTech Sportscar Championship win in this past weekend’s Bubba Burger Sports Car Grand Prix from sunny Long Beach. The team described Saturday’s race as “a topsy-turvy affair” after it struggled a bit early on and experienced a stroke of luck late in the race. The No. 3 Corvette of Antonio Garcia and Jan Magnussen started fifth on the grid and moved into fourth by getting the undercut in the pits after a yellow came out about 40 minutes into the race. The No. 4 car of Oliver Gavin, meanwhile, started third but fell through the order early before handing it off to Tommy Milner, who eventually began to hound the lead pack. GTLM came alive about halfway through the race when the No. 912 Porsche of Earl Bamber, which was one of the fastest GTLM cars on track all day, began pressuring Dirk Mueller in the No. 66 Ford GT for first position. Mueller then accidentally hit the pit limiter on the exit of the corner, allowing the Porsche to easily sail past. The No. 3 Corvette eventually reeled the No. 66 in with just two laps to go. The Ford then ran out of fuel on the exit of the corner, which surprised Magnussen, who obviously expected Muller to accelerate hard off the corner. The Chevy then made contact with the rear of the Ford, sending it into the wall and ending Mueller’s day. Milner, meanwhile, went from sixth to fourth with seven minutes remaining and took an unexpected podium after breezing by Mueller’s now stationary Ford. Corvette Racing may have missed out on its 100th IMSA win, but it will be happy having taken home a solid points haul with a double podium finish. 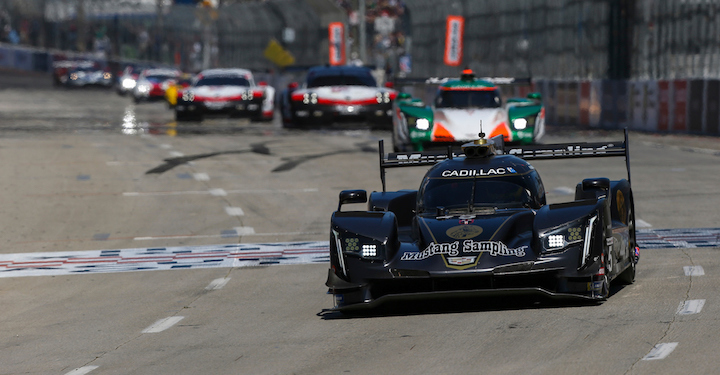 In the DPi class, meanwhile, Action Express Racing took its second win of the season and gave Cadillac its third win in as many races so far this year. The No. 5 Mustang Sampling Cadillac DPi-V.R team got the undercut on the DPi class leaders in the pits and held off a hard-charging No. 7 Acura Team Penske ARX-05 DPi for roughly 30 minutes to take a much-deserved win.